Theater can be broadly categorized in two ways. Presentational theater is a non-realistic style in which the audience is forced into awareness that they are watching a play. Representational theater, on the other hand, incorporates a more naturalistic style. The audience is meant to intellectually and emotionally buy in to the “reality” of the plot, setting and characters. An actor performing in a representational theater piece will be working to portray the emotional truth in each moment. One well-known acting technique used for executing a representational style play is the "method.” In Method acting, the actor uses “sense memory” to call to mind an event in her life that is similar to the emotion that the character she is playing on stage is experiencing. In representational theater, no matter what type of acting technique is used, the actor is fully committed to the truth of the moment, and the audience is meant to feel empathy for the character on stage. The sets used in representational theater will be familiar to audiences, because they are designed to evoke a realistic setting that the audience member herself may have lived in or visited. A kitchen, the interior of a barn, the inside of a classroom – these are all possible settings that the set designer will have created to be as true to reality as possible. Settings aren’t hinted at, but rather are fully realized recreations of reality. Representational plays can be comic or tragic. Sometimes the choice to use a representational style in presenting a play is the director’s. For example, Shakespeare’s "Romeo and Juliet," if done in period style with realistic costumes and settings, can be a representational piece. A creative interpretation of "Romeo and Juliet" could be set on the moon, which would remove the audience from the emotional content of the play and force them to consider aesthetic and contextual aspects of the production. Well-known examples of plays that are written to be performed in a representational style include "The Man Who Came to Dinner," "The Crucible," "12 Angry Men" and "Fences." 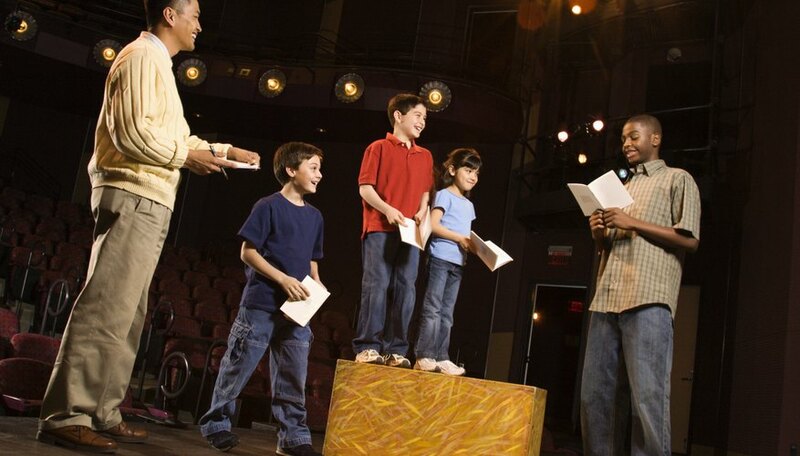 Unlike representational theater, which is meant to be realistic, presentational theater is a style in which the audience is made to be aware of theatrical conventions. Presentational elements can include the use of a narrator, actor asides to the audience, surreal characters or set design pieces, and any excessive theatricality involving special effects. Well-known examples of presentational plays include "Our Town," "Six Characters in Search of an Author," and "Waiting for Godot."